And How Boggs Jewelers Overcomes Them All. Repair Appointment No-Shows. How many times have you waited and waited? Paying Twice. You get repairs done by a friend or someone who is not qualified and the problem doesn’t get fixed. Overcharges. You get one repair price and they charge more. We make sure you know what the total cost is, including service call fees for in-home clock repairs. If your clock repair is extensive (requiring the order of customized parts or servicing beyond what we can do while at your home) we will credit your service call fee toward the total repair cost. Is regular maintenance really necessary? 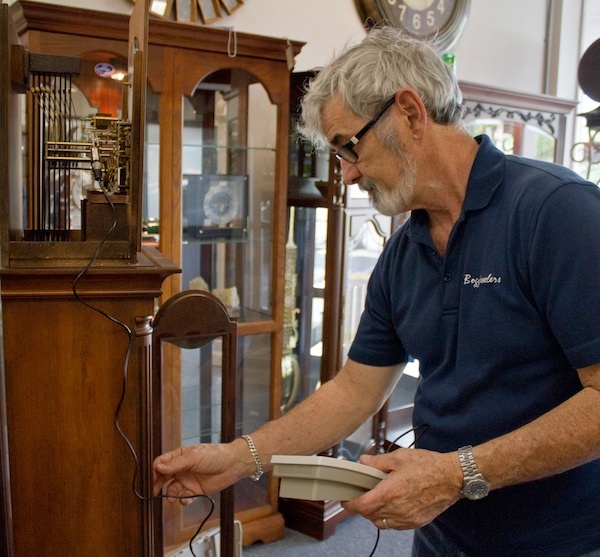 Studies show that over 86 percent of all grandfather clocks don’t get regular maintenance of any kind. This mistake is so common we’re willing to bet you are making it now. The solution is simple. Schedule an annual in-home service check up. If it’s that simple, why didn’t anyone tell you? Most clocks are sold by people who have no particular expertise or knowledge as to how legacy clocks are made. Store clerks typically work on commission and think only of cashing their paychecks. Would You Pay a Few Pennies a Day to Double Your Clock’s Lifespan? Your Clocks Will Thank You! “We have approximately 15 clocks ranging from an 1870’s Black Forest Cuckoo to an Atmos. In the 20 years we have been dealing with Bogg’s, they have either repaired or serviced them all. They’ve done it for a reasonable price and in a reasonable amount of time. Needless to say, we are most pleased with everything they have done for us.” — Carl W.
Customers who switch to Boggs Jewelers’ service say they are glad they did. No more service delays, extra charges or frustration. Double the Running Life of Treasured Clocks for just pennies a day! Boggs Jewelers Guarantee ~ Or You Don’t Pay! Servicing: Howard Miller, Seth Thomas, Herschede, Ridgeway, Hamilton, Bulova, English Tall Case. #1 ~ We Always Show Up On Time. #2 ~ We’ll Repair It Right the 1st Time. #3 ~ Exact Price as Quoted ~ No Add-On Charges. If the repair of your clock is extensive ~ requiring the order of customized parts or servicing beyond what we can do while at your home, we will credit your service call fee toward the total repair cost.